For more information on The Forsaken, read the interviews w/John on Space:1999.org, Powys and Buried.com. "But why are the feelings provoked by John Muir's story so pungent, so alive? Not solely, for being a highly enjoyable and pacey read; nor simply for its connection with the original experience...nor the reminders it provokes of a production that, eventually for me, was to last fifteen months. Above all, it is because the author has got to the place I strived to arrive at with Main Mission Controller Paul Morrow's character." - Prentis Hancock, from his foreword. "...meticulous...breezy, engaging..."-Anthony Ambrogio, VIDEO WATCHDOG. "...the best overview of his [Craven's] career I've seen up to this point....It is written with heart, yet a lot of fun. "-LITTLE SHOPPE OF HORRORS # 14. "...displays considerable scholarship without being academic. "-CLASSIC IMAGES, January 1999. "The commentaries make especially interesting reading...a must-have item for fans of the director who is constantly reinventing himself. 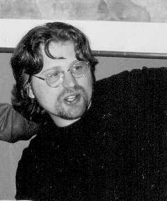 "-Anthony Jackson, SAMHAIN, February '99. 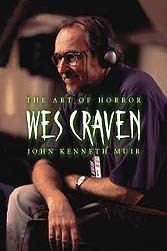 "Wes Craven: The Art of Horror by John Kenneth Muir (McFarland & Company) covers every aspect of Craven's career." - Ellen Daltow, Editor, THE YEAR'S BEST FANTASY AND HORROR (15th Annual Collection). 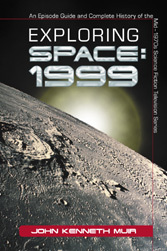 "The book follows a films-of style format, with cast, crew listings, synopses, reviews and commentary. Muir does this stuff well, his enthusiasm for his subject is evident, and this should prove of interest to the slasher fan out there." - CLASSIC IMAGES, June 2004, page 42. "In Wes Craven: The Art of Horror, Muir writes an in-depth analysis and synopsis of Craven's feature films, as well as covering his work in television. Muir has an encyclopedic knowledge of the horror genre and it's amazing he has time to write due to the number of movies he's watched over the years. But Muir separates himself from the true horror geek by giving psychological weight to his analysis and tempering his obvious love of the genre with critical comparisons to not only contemporary films, but the zeitgeist of the times of the films' release." -Scott Nicholson, REALLY SCARY, Jan '05. 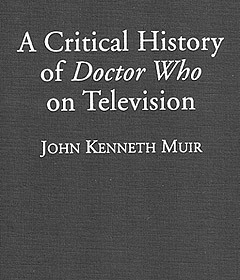 "...he [Muir] seems to have done a pretty good job of explaining and describing DOCTOR WHO here." -INTERZONE, January 20, 2000. "...everything you would want to know about the show and who appeared in it. "-LITTLE SHOPPE OF HORRORS, November 2001. "Doctor Who fans will be delighted with the book..."-Anthony Slide, CLASSIC IMAGES, January 2000. 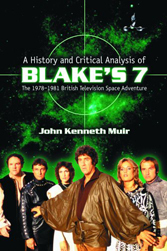 Read an interview with John Kenneth Muir on the subject of his Blake's 7 book at The Anorak Zone! And while you're there, also read the Zone's really interesting (and objective) analysis of the book. "Muir is good at catching details...[Muir's] tying together of themes and threads within the series is a great strength of the book." - Ann Basart, HERMIT.ORG: Deeply Silly Space Series or Heroic Poem? For More Info on this book, click here. "..exhaustive...Think of it as a doctoral thesis on Battlestar Galactica...a critical episode-by-episode review of the original series...he [Muir] remains one of the shows preeminent critics and fans." - Paul Hughes, AMAZING STORIES, January 2005. "Mr. Muir staunchly defends his chosen subject [Battlestar Galactica] especially against the charge it was a mere Star Wars rip-off. He believes it was part of a sci-fi explosion in which both films and television shows took part. The book itself looks at the continuing phenomenon of Battlestar Galactica and how interest in it continues both with fans and producers." It contains an interesting appendix of all the stock footage and models recycled for Buck Rogers in the 25th Century, another Glen Larson project." - Sean Delaney, TV SCI-FI GUIDE, BRITISH NATIONAL LIBRARY (Page 19). 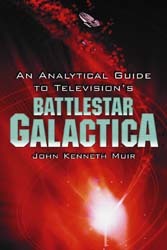 ";...hands down the greatest, most detailed, comprehensive guide to Battlestar Galactica ever written... [a] must have..." - John Dorsey, LT. SHEBA's GALAXY. "...fascinating information...useful and appealing..." - CLASSIC IMAGES. "written with heart, yet a lot of fun."